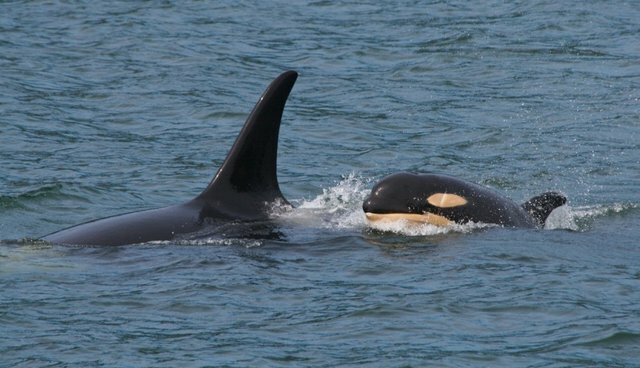 Despite being a 103-year-old great-grandma, the orca named J2 -- or, more affectionately, Granny -- is in great shape. In little over a week, Granny and her pod have traveled 800 miles. This weekend, Granny was spied swimming off the coast of Canada, after a trek up from northern California. The centenarian cetacean can be identified by a white marking on her back and a notch in her fin. Michael Harris, the director of Pacific Whale Watch Association, tells Canadian newspaper The Province that her life span is an estimate based on her children's ages. Whale experts have also confirmed Granny in photos dating back to the 30s. According to the National Oceanic and Atmospheric Administration, wild female orcas usually live for about 50 or 60 years -- although killer whales as old as 90 are not unheard of. SeaWorld, however, contends that "No one knows for sure how long killer whales live." That might be because impressive ages like Granny's have never been mirrored in captivity. For whales born at SeaWorld and other aquaria, says the Whale and Dolphin Conservation, the average life span -- excluding stillborn orcas -- is only 4.5 years.